To add your information to this years poster please contact me with your final details as soon as possible but before Sept 26th. $40 for a small listing and can be paid by email money transfer, cheque or paypal to this email address julie@inciteful.ca or 242 Princess St. Elora N0B 1S0. Finished posters will be distributed to businesses and tourist locations plus, sent to online calendars, social media and news media with a press release on or before Sept 29th. 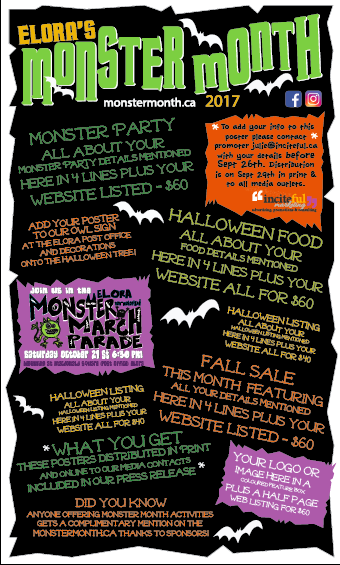 Each listing emailed to me will be added to the Monster Month website for free - my volunteer contribution. Be sure to add your location on Google maps. You have the opportunity to add your hours of operation which will add to your online presence. The convenience in finding your location, phone number and times you are open will benefit you and your customers. Take a moment before resting to note events and corrections needing to be made. Lets face it you certainly need a report to refer to. After all the work you've done something will be forgotten and it is better to make note now rather than remembering once it a solution is needed ASAP. iPad iPhone iMac classes I’ve been using a mac since before there was internet. I’m sure I can help you get started and/or solve a problem or two. $40 for a one hour class - $20 per additional person.